OOoh nice! Read The Lost Prince just this week and loved it! Also got Girl of Nightmares! Can't wait to read it! You are not a horrible blogger, you are awesome! YAY for The Lost Prince. I can't wait to discuss once we have both read. Girl of Nightmares was awesome so I hope you enjoy it. Aaah, I sooo need to buy a copy of GIRL OF NIGHTMARES - can't believe why I haven't yet. But I'm also quite excited for THE IRON PRINCE, although I'm trying to put off reading it until it's closer to its release date. :) Happy reading, my dear! omgosh, that cover for The Girl of Nightmares looks amazing! I have the US hardback of Anna so I might have to get the US Hardback of that too, especially as Anna only just cae out here and I'll be waiting over a year for The Girl of Nightmares! Very exciting books for you this week!!! Awww, your original nook makes me nostalgic for mine, since it broke last month. *sniffles* Enjoy all of your titles this week! Oohh nice haul! 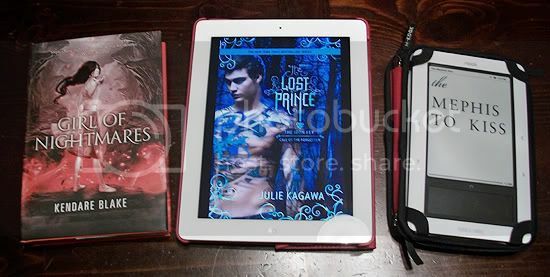 Girl of Nightmares was just amazing, and I'm super excited to read The Lost Prince! I need Girl of Nightmares; that cover is amazing and I can't wait to continue the story! Enjoy your books! Awesome looking reads, Christy! I am like the last person who hasn't read anything by Kagawa, but I think a friend is loaning me The Immortal Rules soon, so I'll start there, hopefully! Really need to get to the Anna series. *sigh* So many good books! The Lost Prince! I haven't requested it yet, hoping to get through a few books first, but I definitely can't wait to read it. Happy reading :).